While reading reports from various international organisations in the early stages of my research, I found it hard to believe how the environment is not given the same status as other global issues. It is an anomaly of the United Nations that there is no dedicated environmental organisation amongst the 15 autonomous, specialised agencies. This secondary status and the lack of coherence over responsibilities harms environmental governance at the global scale. Would having a World Environment Organization help coordinate global environmental and climate change efforts? A World Environment Organization would collaborate global efforts towards mitigation of and adaptation to all environmental challenges, of which climate change may be the largest. As summarised by the AAAS’s excellent What We Know report, ‘we are at risk of pushing our climate system toward abrupt, unpredictable, and potentially irreversible changes with highly damaging impacts’. There has been 40 years of debate over a World Environment Organization, starting with calls from US foreign policy strategists for an ‘International Environment Agency’. Instead, following the 1972 Stockholm Conference on the Human Environment, the United Nations Environment Programme (UNEP) was created the following year. Despite this positive step, this was a weaker reform than many had proposed. This also effectively curtailed further debate over a specialised agency for the environment. Such a global body was again suggested in 1989, by the Netherlands, France and Norway principally, in order to create an organisation to manage the atmosphere globally. In 1997, Brazil, Germany, Singapore and South Africa called for a global umbrella body for the environment. The need for more efficient environmental activities in the UN system was once again recognised at the 2005 World Summit, and a draft proposal for environmental governance reform was discussed in 2008. Such efforts were allowed to stall by February 2009.
ensuring a cohesive approach to meeting country needs. This formed part of the negotiations over the content of the conference and the discussions over the draft outcome document. In the wake of Rio+20, it was recognised that global sustainable development issues need a permanent international champion. In the outcome document The Future We Want, Rio+20 failed to uphold the proposal of the draft that UNEP should be ‘upgraded’ to a UN specialised agency, like the World Health Organization. Even after 20 years of international conferences since Rio, there is a specialised agency for Industrial Development, but not Sustainable Development. The compromise that followed in late 2012 was to grant universal membership to UNEP, and provide it with more funding. The press release told us that the UN had listened to what the world had said in Rio de Janeiro, but it does not tackle any of the structural problems identified at Rio+20. There are over 500 Multilateral Environment Agreements. UNEP is, on the whole, unable to help with implementation of policies. It has around 15 offices, whereas the UN Development Programme has 177. 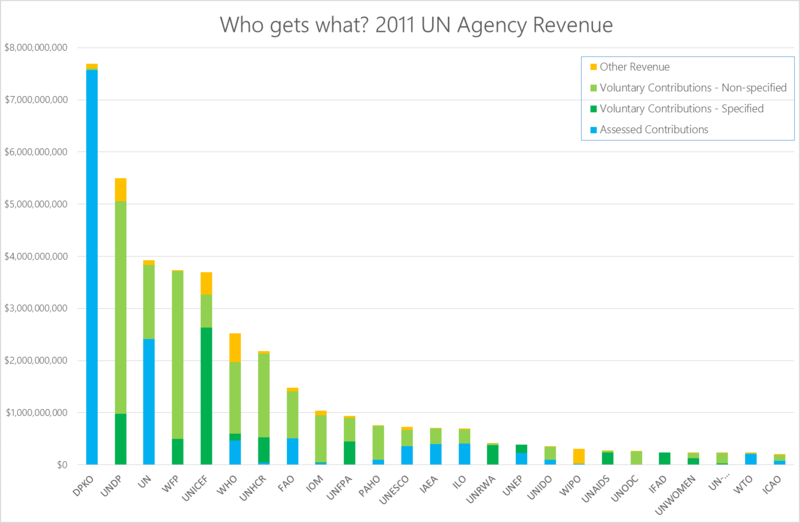 Financially, its budget utterly pales in comparison to other organisations, as the following chart indicates. 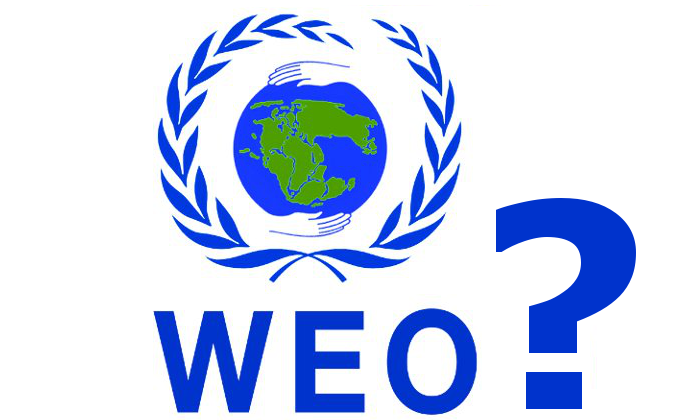 There is also significant overlap of functional expertise; a WEO would deliver the same specialisation of expertise that has been a feature of the UN system to date, and greater coordination on environmental issues. According to a recent report, 62 of 66 countries studied have ‘flagship’ climate change legislation in place. Countries are taking action, but international coordination is conspicuous by its absence. If there are to be Sustainable Development Goals post-2015, as with the Millennium Development Goals, there needs to be an organisation to coordinate efforts and monitor progress. If supplied with adequate funding, a specialised agency for the environment could deliver greater regional presence and enhanced applied capacity on the ground, as well as greater technical and policy assistance to governments. The lack of a WEO remains a clear sign that the environment is not given the same global status as Trade, Health and Labour, or even Maritime Affairs, Intellectual Property and Tourism. This is despite the existence of high level political groups on sustainable development, or initiatives like Ban Ki-moon’s Year of Sustainable Energy for All. But is it too late? There would certainly be difficulties in integrating the disparate secretariats of the environmental treaties and protocols, which fill the void left by the lack of a more powerful specialised agency. I would argue that UNEP reform is a step in the right direction, but the job is far from done. Will there be renewed calls for more cohesive global governance with the release of the IPCC’s Working Group III report later this year? The UN Economic and Social Council does have the mandate to create a specialised agency, a move that is strongly supported by 35 nations, but not backed by the US, Russia or China. Forty years on from Stockholm and 20 years on from Rio, a World Environment Organization still seems a long way away. Biermann, F., 2011. Reforming Global Environmental Governance: The Case for a United Nations Environment Organisation. For Sustainable Development Governance 2012, Stakeholder Forum. Barbier, E., 2012. The Green Economy Post Rio+20, Science, 338. Ivanova, M., 2012. Institutional design and UNEP reform: historical insights on form, function and financing. International Affairs, 88(3). PhD Candidate in the Department of Geography at University College London, researching the definition and measurement of the global green economy. This entry was posted in Climate, Future, KlimaSnakk and tagged Climate change, environmental governance, sustainable development, unep, united nations, World Environment Organization. Bookmark the permalink. 2 Responses to Where is the World Environment Organization? Very nice piece, it is good to read about some of the political aspects of environmental governance and its historical development. One alteration I would suggest is highlighting the ‘UNEP’ tick mark on the graph you include to make it easy for the reader to spot (took me a while). Your writing flow is nice and keeps the reader engaged. I particularly like the use of a rhetorical question to draw the reader in to the second to last paragraph. Hi Amee, thanks so much for your comments! On the graph, I actually really wanted to do this but couldn’t find a way to do it that looked good… If I do, I’ll update the graphic.